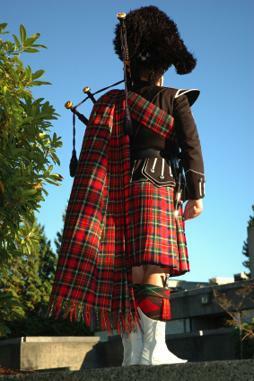 The Scottish piper has given much to the world in the last few hundred years, not least of which is the Scottish music. For me personally that term always brings to mind the "lone Piper" who stands on the battlements of Edinburgh castle, at the end of the Edinburgh Military Tattoo playing his lament. There is something about the bagpipes that stirs the blood, not only of Scotsmen but almost anybody who hears them, don't you think? They are very often seen at weddings, as they bring an added sense of occasion to the festivities. Below you can see the piper waiting outside the church, for the bride and groom after the ceremony is over. When I got married here in Bavaria, my wife Heike and I decided on a Scottish /Bavarian theme for our wedding, and we were lucky to find a local piper who was passionate about the bagpipes, so of course we hired him to play at the wedding, and he went down a storm with the locals. Traditionally Scottish piper's have their roots in the military, where they have been a part of the Scottish regiments since the early seventeenth century. Originally they would have been paid by the officers, to play for them in their Mess after dinner. It was Queen Victoria who persuaded the War Office sometime during the eighteen forties, that each regiment should be allowed five pipers and a Pipe Major. And this is the number that the British army continue to provide funds for to this day. If you are lucky enough to visit Scotland, you will almost certainly come across at least one piper on your travels. And just to whet your appetite I've embedded a video from the 2007 Edinburgh Military Tattoo, which starts of with the Lone Piper. Also on the banks of loch Ness for example, stands the ruins of Urquhart Castle, now the castle dates back to 1296 and is visited by many thousands of tourists each year. And in a small car park in the vicinity during the summer months, stands a lone Scottish piper playing for the tourists. He often draws a crowd, and is more than willing to be photographed with tourists. Many of them play with pipe bands, but will often be hired as lone pipers to play at occasions such as Burns Suppers, where they are required to pipe the haggis into the dining room. Hogmanay (New Years Eve) is another occasion in Scotland when they are very much in evidence, as traditional festivities almost always include bagpipe music. And no Ceilidh would be complete without at least one piper being there. So Scotland has, as you can see, a very long tradition of pipe music which they have exported to every corner of the world. And as the years go by the appeal of the pipes just keeps getting stronger.